A woman’s work is never done. And a man’s (or a woman’s) firewood is never done either. Once again, I am three months late filling the shed, having missed a vital summer of airing and drying. The weather dial has been set back on to “dark grey” and “downpour”. While a few days soak on your freshly cut logs does help dry out the sap, you do not want to leave your seasoning wood in the rain through a winter. You want a sun-facing shed, with some clear roof and wall panels. Better still,wall with gaps or slats to let the drying breeze through the stack. Split your logs green as it’s easier. If you’re getting a bit past it, logsplitters are amazing. They even do the gnarly ones. This year I am sacrificing poorly shaped, ten to twenty year old macrocarpas, lusitanicas, Lawsons and the odd blackwood. Some nitens have died standing there which is handy, like a vertically stored woodstack. You can harvest it after about three years (earlier for a pine or it will just be bug-riddled fluff) and throw the split rounds straight on the fire after a few weeks lying around in a pile. The green Lawson Cypress smells amazing as I cut and split it with the axe. A real refreshing, cedar-oil scent. It splits easily, and though it may seem a waste, these were the trees with kinks and bulges that weren’t going to be good timber logs. The good ones I remember to leave growing - so don’t cut them down for firewood. Same goes for any cypress gum etc with a straight trunk up to 6 metres: it will be worth far more as timber later on. For quick turnaround, the reliable coppice trees that burn well, grow fast, and grow BACK, when cut, are: Eucalyptus ovata; Eucalyptus fastigata, Alders (Alnus), and willows (Salix). You coud plant a firewood area with these and take a continuous harvest of small diameter wood, easily cut with a small chainsaw. Just tidying up your wee plantation will yield a good load of combustible material. Trees among your forestry block that grow fast, burn well, but don’t grow back, are: Pines, Macrocarpas, Lusitanicas, Leyland cypress, Lawson cypress, any other gums eg Eucalyptus nitens, Ash (Fraxinus), native firewoods like Kamahi (Birch). You may need larger saws and the assistance of young folk to deal with the larger rounds. But they sure fill up the woodshed. Call it “Rugby Training” or “Karate Practice”. If that doesn’t work, pay them $20 an hour and call it Work Experience. Pohutukawa, Totara, Apple. An interesting forestry combination! But it ain’t gonna happen. 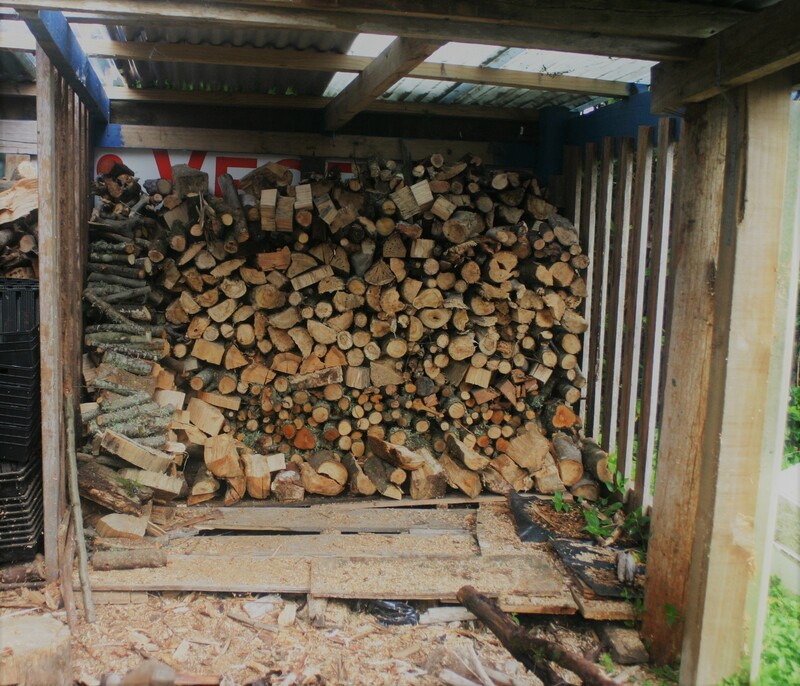 Relatively fast firewood for cold mountain locations can be grown from Larch, Silver Birch, and Douglas Fir. But check local rules about verboten tree types.